The German Congregational Church (die Evangelischen Kongregational-Gemeinden von Nord-Amerika) played a prominent role in the religious life of many Volga Germans who settled in Portland. "Although foreign to most native Germans, Congregationalism appealed to Protestant 'Russlanddeutschen' (Russian Germans), particularly those from Lutheran parishes. They had been raised in a milder Lutheranism than was often encountered in the United States, and some had actually experienced revival and regeneration in Russia. Mid-nineteenth century American Congregationalism offered a style of church life that was seemingly designed for them—a fact made clear when one looks at their unique social and religious development." Ribbon from the German Congregational Church General Conference held in Fresno, California in June 1939 courtesy of Marie Trupp Krieger. The German Congregational congregations were largely independent and allowed their members to worship in a fellowship style without much liturgy. The Brethren, who held regular gatherings in private homes and in the church, provided a strong laymen's organization within the congregational structure. Were it not for the Brethren, Volga Germans would not have joined Congregational churches after their immigration to the United States. Participation in the Brotherhood required membership in a church, and Congregationalism’s emphasis on the autonomy of the local church and the priesthood of all believers appealed to them. Because so many members of the church members belonged to the Brotherhood, in some towns the church was simply called die Brüder Kirche or the Brethren Church. This was true in Portland where that moniker was given to the Free Evangelical Brethren Church which later became the German Evangelical Congregational Brethren Church. Early pastors and leaders in the congregational movement, such as Johannes Koch, came from Russia where they had been sexton-teachers (called schoolmasters in the Volga Region) before moving to the Americas. This title and experience allowed them to become pastors without an academic, university education. Rev. Koch became a driving force in the formation of the Pacific Conference of Congregational Churches. Others pastors such as Johannes Hopp and Conrad J. Wagner came from various mission seminaries, including the Chicago Theological Seminary and the Basel Mission Seminary in Europe. The General Conference of the German Congregational Churches of North America was organized in Crete, Nebraska in the summer of 1883 during the time of strong German immigration to North America, especially the ethnic Germans from Russia. The purpose of the conference was to strengthen communication and cooperation between and among the German churches which were then scattered across six states. The Pacific Conference of German Congregational Churches, covering the states of Oregon and Washington, was organized on March 5, 1897 at the Ebenezer German Congregational Church in Portland led by the following ministers and delegates from Portland: Rev. Johannes Koch, Brothers Peter Yost, John Krieger and Conrad Yost. Rev. Jacob Hergert, who was serving the Evangelical Lutheran church in Endicott, Washington at the time, was also present. Thirteen churches were received into the conference at its founding. The Pacific German Congregational Brethren Conference at St. Matthews Church in Odessa, Washington from May 29 to June 1, 1930 was attended by many people from Portland, including Rev. Heinrich Hagelganz (shown seated at the far right holding two books). Photograph courtesy of Raymond P. Koch. The General Conference of the German Congregational Churches was held in Portland in 1917 (moderated by Rev. Fath), in 1927 (moderated by Rev. H. Obenhaus) and 1937 (moderated by Rev. J. L. Hirning). The German Congregational publishing operation was located in Chicago from 1888 until 1895, when it was moved to Michigan City, Indiana. In 1905 it was moved back to Chicago. The German Congregational Publishing Society — as it was officially known — printed works bearing an illustration of a Pilgrim and the name "The German Pilgrim Press. The first gesangbuch (songbook) was authorized by the General Conference that met in Chicago in 1896 and was in use by 1898. Both the first and second editions were ohne Noten — without music — requiring someone to lead the singing who had memorized all the melodies. The third and final edition contained the music and all the words. This edition was the preferred hymnal of most church members, who proudly carried the books to worship services and prayer meetings. Two supplementary hymnbooks were used in prayer meetings. Social Gospel theologian Walter Rauschenbusch and Ira Sankey, who had accompanied Dwight L. Moody on so many of his tours, produced a collection of American gospel songs in German translation - Evangeliums-Sänger — that was popular. Der Köstliche Schatz was prepared for Brotherhood use by a Volga German Evangelical Synod pastor in Portland, Oregon, Elias Hergert, who had been an Eden Seminary classmate of theologian Reinhold Niebuhr. It contained some Brotherhood songs from Russia as well as recent compositions by Hergert and others, a few of which were in English. A Catechism for the German Congregational churches first appeared in 1904. Attempting to include the basic teachings contained in Luther’s Small Catechism and the Heidelberg Catechism, it had 150 questions and answers and 50 questions to be answered by confirmands during a final oral examination before the entire congregation. The Catechism was divided into five sections: the Apostles’ Creed, the Ten Commandments, the Uses of the Law, the Lord’s Prayer, and the Sacraments. Unlike Luther’s catechism or the Heidelberg Catechism, the German Congregational Katechismus began by asserting the centrality of scripture. Rather than beginning with the Law or humanity’s need, as Luther’s catechism and the Heidelberg Catechism do, the Katechismus started by establishing the place of the Bible in people’s lives. As time went by the congregations and its members seem to have lost more and more of their Evangelical Lutheran heritage as younger generations were no longer taught Martin Luther's Small Catechism, instead using catechisms that had a more Reformed (Calvinist) view of the sacraments of baptism and the Lord's supper. Thus a disassociation with the main Evangelical Lutheran heritage of its ancestors ensued in North and South America although there was freedom to practice according to one's conscience and the Word of God. By the 1940's, ninety-seven percent of the German Congregational churches were made up of Germans from Russia and their descendants. The Evangelical and Reformed Church and the General Council of the Congregational Christian Churches united in 1957 to form the United Church of Christ (UCC). A shift to theological liberalism in the UCC over the years caused a large percentage of congregations to leave that denomination. Many churches, such as the Second German Congregational Church in Portland, chose to remain independent. "The descendants of the Russian Germans who embraced Congregationalism are often troubled by the UCC’s emphasis on social action. To them, the UCC seems too political and not grounded enough in scripture. This reaction is characteristic. 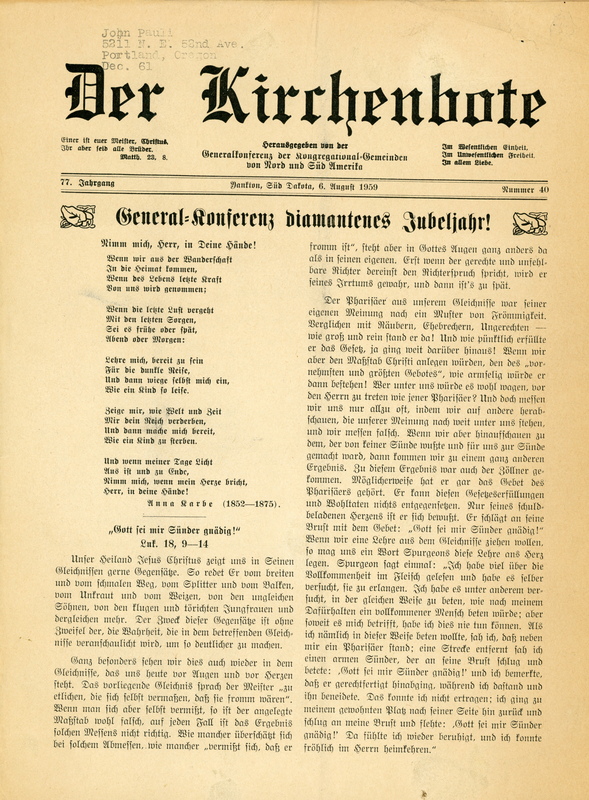 The unique heritage of the Russian Germans laid great stress on the Bible, religious experience, and sanctified living. It was an individual gospel, expressed in prayer meetings, worship, and performing kind deeds among one’s neighbors. Although prayer meetings have almost disappeared and revivals are no longer a feature of church life, such piety remains powerfully latent. German Congregationalism has made a unique contribution to the United Church of Christ. Even though its outward form is changed, the inner spirit continues to radiate." "Der Kirchenbote" (The Church Messenger) dated August 6, 1959. This publication was widely read by members of the German Congregational churches in Portland, and more broadly in North and South America. Source: Collection of John Pauli. Chrystal, William G. "German Congregationalism." Hidden Histories In The United Church Of Christ - Volume 1. United Church of Christ. Web. 11 November 2016. <http://www.ucc.org/about-us_hidden-histories_german-congregationalism-on>. Eisenach, George J. A History of the German Congregational Churches in the United States. Yankton, SD: Pioneer, 1938. 99. Print. Gutsche, Rev. Horst. GER-VOLGA Digest, Vol 10, Issue 96, 12 June 2015.